Yeah, you read that correctly, the first book I read for this project was actually the second one on the list. My library took it’s time finding both the number one book (Saul Bellow’s The Adventures of Augie March), but got this one to me right away. So it goes. Aside from having to forfeit the competition altogether by not following the rules to the letter (just kidding), I quite enjoyed this book, tearing through it in about three days. The story is about a former history Ph.D. student turned hard-bitten 1930s newspaperman named Jack Burden. When he is tasked with reporting on county treasurer turned gubernatorial candidate Willie Stark, he finds out that not only is history far more tied to the present than we realize, it can actually reach out and bite you if you root around in it too long. Burden joins Stark on the campaign trail, eventually becoming one of his brightest cronies once he reaches the Governor’s Mansion. 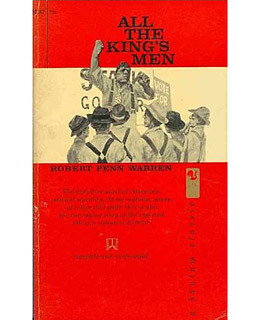 Apparently Warren himself never thought of it as a political novel, saying as much in his introduction to the Modern Library edition, and I’m inclined to believe him. While for most of the book Burden acts as a sort of bagman/blackmailer for the Stark Administration (Stark is referred to either as the friendly “Willie” by his constituents, who see him as just an ol’ country boy made good, or “The Boss” by those who toil beneath him and recognize his capacity for great rage), the real meat of the story is not found in back-room bargains and stump speeches; it is actually about Burden realizing just how connected everything in his world really is, and his attempts to first back away from this fact, then reconcile himself with it. Burden is a man drowning in the past; he puts off his Ph.D. dissertation on a distant ancestor named Cass Mastern indefinitely and becomes a reporter after discovering his research subject’s great sins act as a mirror for his own. The “Cass Mastern” section of the novel initially read to me as almost like Warren was throwing a short story he’d written before into the mix in a sort of metatextual exercise. Boy was I ever wrong, that part was basically the groundwork for the entire second half of the piece, which devolves into a sort of Southern Gothic Grand Guignol. 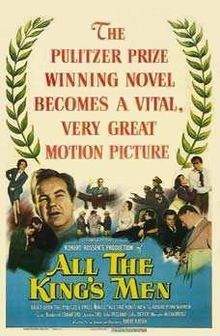 I was struck many times throughout the narrative as to how completely unsuited this fantastic novel would be to Hollywood, but apparently I was only half right, as the 1949 feature film did very well, while the 2006 re-imagining didn’t do as well. I’d actually really like to watch both versions now, but the movie watching this year is to primarily be undertaken by my better half. Oh well, into the book of movies you go. Actually, speaking of movies, one film that this book really did remind me of was the Coen Brothers’ 1990 film Miller’s Crossing. Jack Burden’s initial aloof attitude towards the people around him really reminded me of Tom Reagan (played by Gabriel Byrne), the consigliere to two Irish mobs in a 1930s city. Both men have a difficult relationship with their bosses, and are forced to dig around in the muck of history to try and cover their employers’ asses, uncovering things that should have stayed down there. I’m also sure there’s a little bit of Willie Stark in any portrayal of a Southern populist-type politico since the book’s publication, be they Southern Democrat like in the Depression era, or staunch Republicans in modern times. The West Wing, anyone? 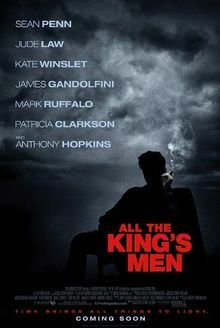 More than anything, though, All the King’s Men would have its closest ressemblance to The Wire, which also teaches us how interconnected our world is when it really doesn’t look that way all the time. I don’t have too much left to say about the novel, if you’ve noticed I’ve basically been writing this blog “automatically”, in a sort of stream of consciousness style. I really wanted to get all this down before I forgot anything, as there’s a whole bunch more books I have to read ahead of me this year. Maybe I’ll come back to All the King’s Men in the future, when I have more time to think about it. Anyway, I would definitely recommend this to anyone looking for a good book. Next on the Resolution Project: Saul Bellow’s The Adventures of Augie March (1953)!